Food grade grease (FGG is a kind of lubricant made from vegetable oil. Food Grease isconsidered safe for healthy and it does not pollute the environment so that it can be veryimportant for particular industries such as pharmaceutical, animal feeding, cosmetic, andespecially food industry. This study is aiming at obtaining optimum basic formulation ofthickening agent (LiOH) that can produce qualified food grade grease. It is a kind of factorialexperimental study by using complete random sampling. Based on Fisher test, the treatmentshows a different result significantly. Then, it is continued by conducting Duncan’s MultipleRange Test (DMRT). 2% of activated charcoal is the best treatment because it results FFAscore, lower water content, and the bright yellow color that is shown by the score of 5.48%,0.0498 %, and 3 % that successively obtained. The treatment on thickening agent (LiOH)(P1) and the revious one (L1) are the best treatment which produce qualified food gradegrease, corrosion resistance value 12.0, dropping point 130C, lubricating texture value 1,pH value 9.45, water content 0.19%, and ash content value 0.76%. TOTOK, Martanto; SUSANTO, Anto; PRATIWI, Indra. Food Grade Grease Berbahan Baku Minyak Sawit Crude Palm Oil (Cpo) Off Grade Dengan Variasi Konsentrasi Thickening. 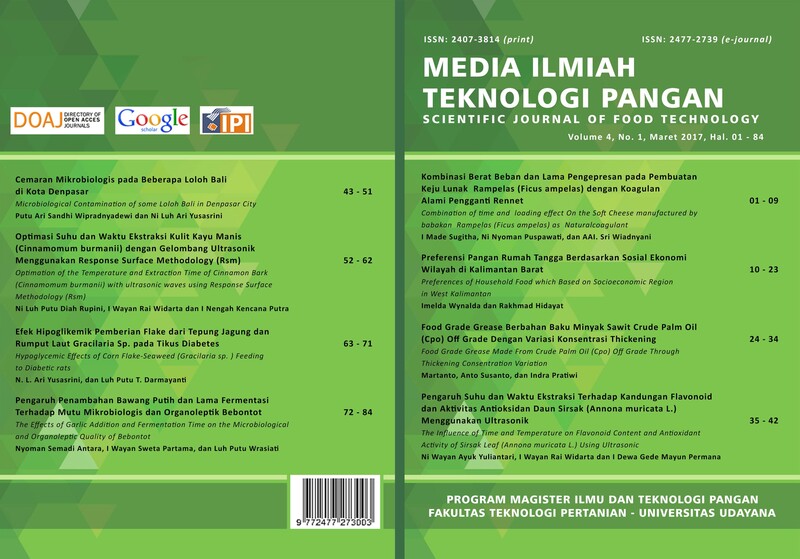 Media Ilmiah Teknologi Pangan (Scientific Journal of Food Technology), [S.l. ], v. 4, n. 1, p. 24-34, mar. 2017. ISSN 2477-2739. Available at: <https://ojs.unud.ac.id/index.php/pangan/article/view/29811>. Date accessed: 26 apr. 2019. Aulia, R. 2012. Pembuatan gemuk. Minyak Sawit Di Kabupaten Purbalingga. Ketaren, S. 2006. Minyak Dan Lemak Pangan. Prihandana, R., R. Hendroko dan M. Nuramin. Mengatasi Polusi dan Kelangkaan BBM. Sudarmadji, S. B. Haryono dan Suhardi. 1996. Analisis Bahan Makanan dan Pertanian. Sebagai Bahan Dasar Pelumas Grease.